Todd K Meadows - Crunch Dunk Blog | News For The Hustle and Hustlers! But, the most amazing part of this is that Chick-fil-A only operates 2,225 restaurants. That’s less than a sixth as the top three earning restaurants and less than half as many as the rest of the franchises ahead of it. 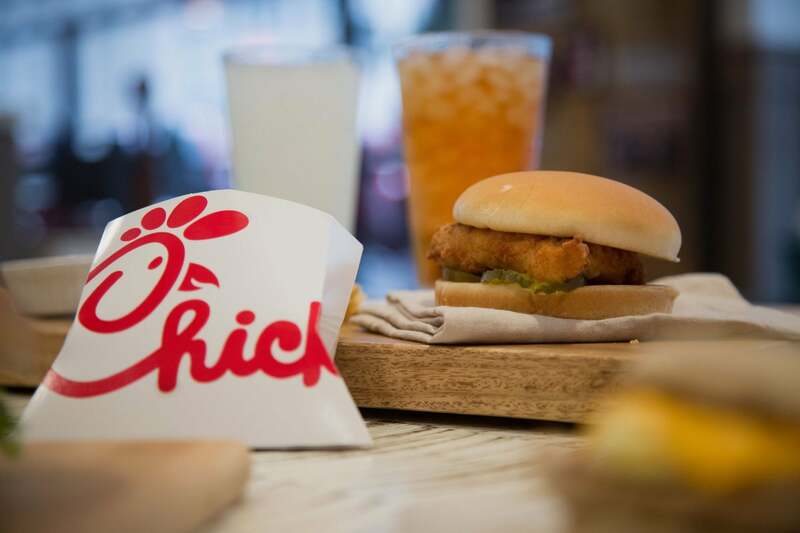 Of the top-50 earning restaurants, Chick-fil-A ranked 21st in the number of units. Dear Readers: Comment and give us your feedback now. Your friends like to see the same things you do, right? Please share with them and let them see this too. Do you commit errors including fragments, run-ons and nonparallel construction? Here's how to stop. 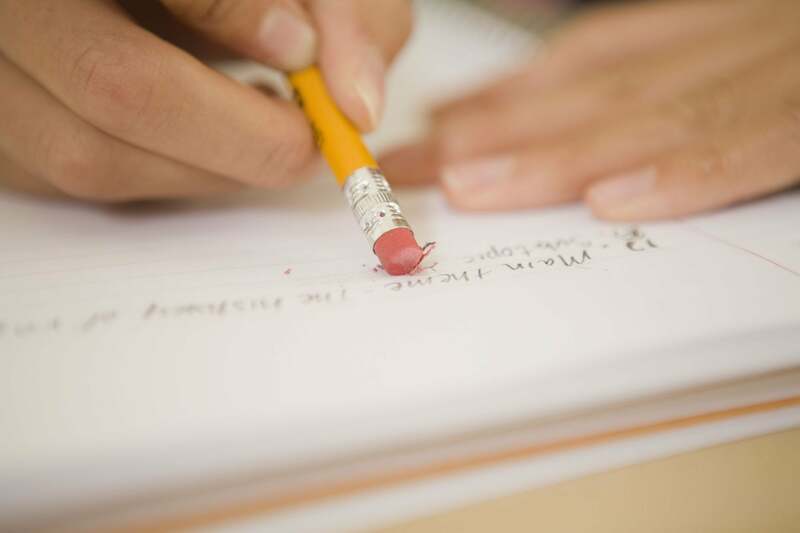 Welcome back to Entrepreneur’s easy, no-tears guide to better grammar and writing. Lesson 1 covered correct use of pronouns and strategies to cut wordiness. See the problem? Those phrases -- walking down Fifth Avenue and strolling about South Beach and while working on the annual report all lack a subject, a "doer." The phrases themselves are modifiers because they tell you about an action that someone or something in the sentence is doing. But, who is that, exactly? The library lions? South Beach’s hotels? Janet’s computer? Walking down Fifth Avenue, I marvelled at how regal the library lions looked. When you stroll about South Beach, you'll see art deco buildings, including the Park Hotel. Janet’s computer crashed while she was working on the annual report. So, that’s the scoop: no more danglers for you. Give them subjects, meaning humans or animals or machines that could conceivably perform the action described. Incorrect: The assistant forwarded the email to his boss covering the new proposal. Correct: The assistant forwarded the email covering the new proposal to his boss. See how just moving that modifying phrase to the correct place in the sentence (i.e., right next to the word it modifies -- “email” -- makes all the difference? Problem: As the manager and leader, people will look to your behavior as the example. Fix: As the manager and leader, you should set the example in terms of your behavior. Problem: In fact, in a report by D--- K----, professor emeritus at Virginia Tech., people who regularly write down their goals earn nine times as much over their lifetimes as the people who don't. Problem: It’s just not the major upsets, either is awkward. Fix: It’s not just the major upsets, either. Fix: Welcome employees even before they start. Sentence fragments are just that: partial bits of sentences, not full sentences. Fix: When I was a boy, our town was small and sleepy; nothing ever happened there. A run-on sentence is not a sentence that's overly long. Emily cleaned the kitchen, Andy swept the living room. The above sentence has two independent clauses (meaning they have both a subject and verb). These must be separated by a conjunction (and, or, but); or a semicolon; or a period and capital letter (to start a new sentence). Emily cleaned the kitchen; Andy swept the living room. Or: Emily cleaned the kitchen, and Andy swept the living room. Problem: Ms. Brown dictated a letter, her assistant transcibed it. Fix: Ms. Brown dictated a letter, and her assistant transcribed it. Nonparallel construction means that elements in a sentence differ from one another in an awkward way. Fix: Plenty of research goes into launching a business, understanding the market and determining how our product meets customers' needs. Problem: Other innovations to the game have included the introduction of Wild Card teams, modifying overtime rules and creating a frenzy with free agency when the new season begins in March. Fix: Other innovations have included the introduction of Wild Card teams, modifications to overtime rules and the frenzy that free agency creates every March when the new season begins. Taken one by one, these errors may seem minor; but a document with numerous instances of nonparallel construction, run-ons, etc., will seem "off" to the reader. Don't let this happen to you. Clean up your writing! The people burning their Nikes weren't buying many shoes anyway but those who support the ad are the people Nike anticipates will buy shoes for decades to come. On the 30th anniversary of the iconic Just Do It slogan, Nike released an advertisement featuring a black-and-white image of Colin Kaepernick with the text “Believe in something. Even if it means sacrificing everything.” Within minutes, social media was abuzz with reaction. The ad went viral. The social media firestorm was a mix of praise and criticism towards Nike. Some applauded the company for taking a stand while others went so far as burning their Nike apparel to start a #BoycottNike movement. An ad that causes (previously) loyal customers to burn the company’s products is rarely called a success, but with Nike few things are ever that simple. Nike must have known that hiring the face of the most controversial movement in the NFL was going to cause an online maelstrom. So why take the risk? Why set yourself up to lose an entire demographic? Because that group never mattered to you anyway. By looking at the online conversations surrounding Nike and their Kaepernick ad, we can see that Nike knew exactly what they were doing. Was it a calculated risk? Sure, but with the emphasis firmly on "calculated." Will Nike’s real audience please stand up? Surveys show that younger, liberal audiences prefer companies to take a stance on important issues. 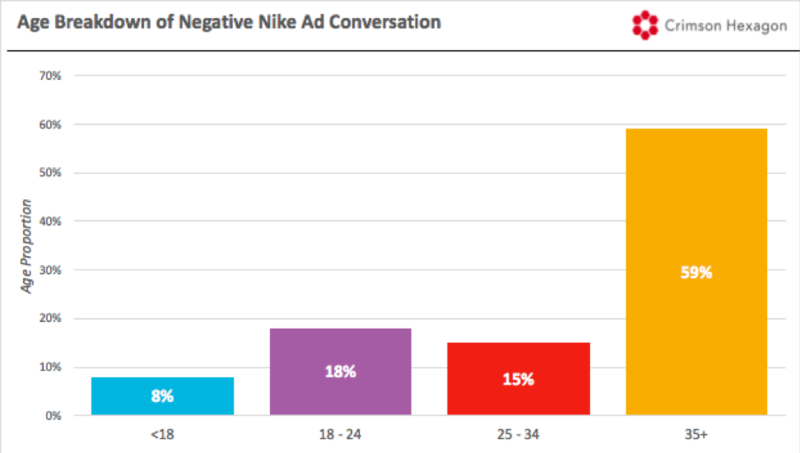 Nike’s core audience is disproportionately young and more liberal than average, so the brand had good reason to believe that a bold, politically-minded ad would ultimately have a positive impact on its core audience. But this is only the beginning of the story. 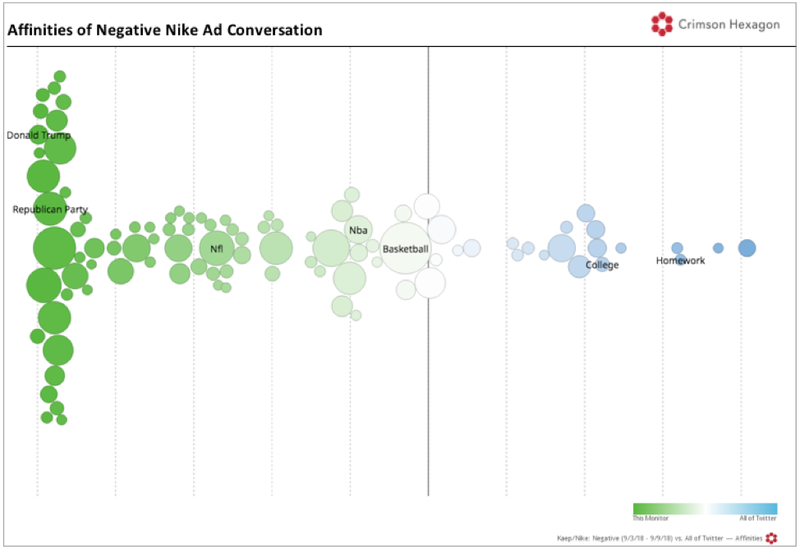 By looking at social media audiences discussing the campaign, and Nike’s conversation overall, we can go further than the surveys to showcase how brilliant the marketing move truly is. 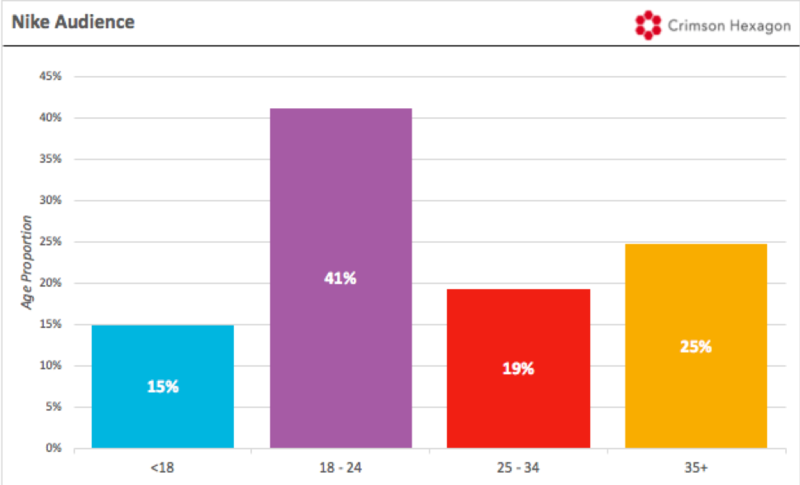 Looking at the general Nike conversation, Nike’s core audience is young, with only 25 percent of people discussing Nike online being 35 or older. And when it comes to their main interests, the Nike audience is much more interested in youthful topics like high school and snapchat. The rest of Twitter is much more interested in science, technology and software development, less relevant topics, but common to older audiences. 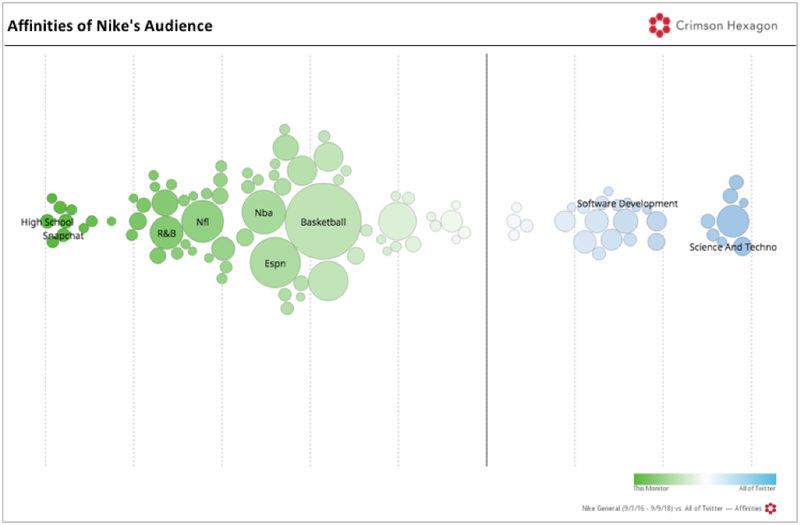 Comparing Nike’s audience to the groups of consumers positively and negatively posting about the Kaepernick campaign reveals something fundamentally important: the people who spoke positively about the ad were much more in line with Nike’s target audience. The audience affinities for those positively discussing the campaign perfectly line up with the same affinities of the general Nike audience. High school and snapchat interests confirming their youth, and the older topics that don’t interest them. 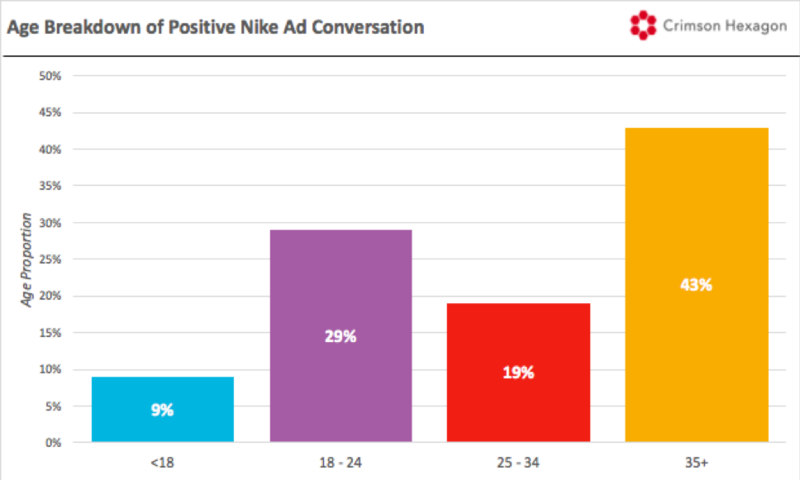 The age breakdown is slightly different than in Nike’s overall audience, but compared to those posting negatively about the ad (below), the positive group is much younger. 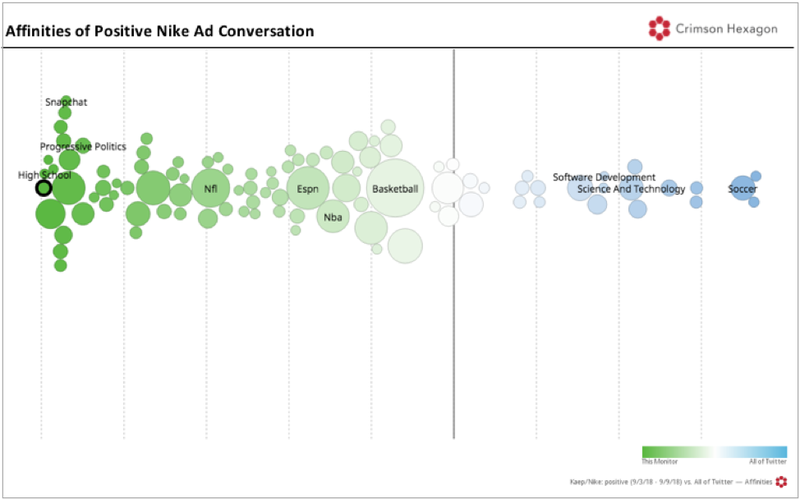 The negative group, conversely, has very different interests than Nike’s core audience. Those tweeting negatively about the ad have a strong affinity for the Republican Party and Donald Trump. The group has no interest in homework or college. In the end, Nike isn’t as concerned about angering this group of people because they aren’t the brand’s core customers. The age breakdown of the negative conversation is much older than the positive conversation with almost 60 percent being 35 or older. Nike knew that a social justice advertisement would land favorability with a younger, more progressive crowd. They certainly knew that was the audience that they sell to most. Market directly to them, and what do you get? A 30 percent increase in sales following the release of the advertisement. Related: Amidst Controversy, Should Brands Distance Themselves From Facebook Advertising? And that wasn’t the only area where Nike won. Not only did their sales skyrocket, but their social volume did as well. 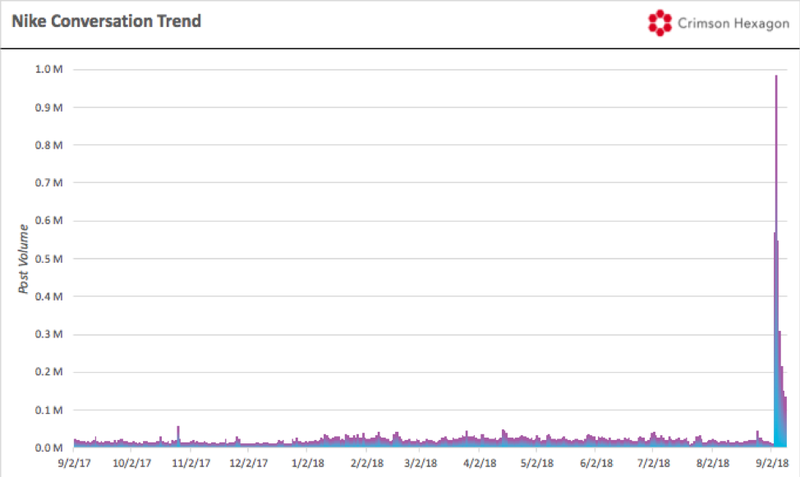 Typically experiencing about 20,000 posts per day over the last year, Nike saw almost 50 times that the day the ad was released. Almost 1 million posts in that day alone off of the ad is enough to warrant the money they were paying Kaepernick to feature in it. Nike did everything right with this ad. They understood their audience and they created a masterful advertisement for them. They had been paying Kaepernick for a long time, waiting for the right time to utilize him, and they picked the perfect moment. Being honest with yourself about your ideal world and genuine joys will help you boil down your true purpose. 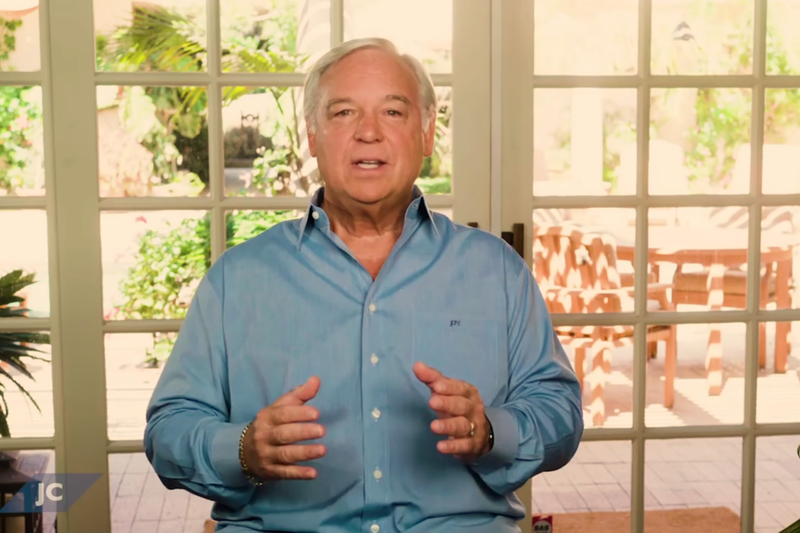 In this video, Entrepreneur Network partner Jack Canfield talks about narrowing down your purpose and how using that concept to guide your life can be extremely enlightening. What are the two qualities I most enjoy expressing in the world (e.g. joy, enthusiasm, authenticity)? How do I most enjoy expressing these qualities in my life? What would the world look like if it were operating perfectly? As Canfield explains, for most people, a purpose can be boiled down to expressing one's natural qualities in a way one enjoys to achieve one's ideal world. By connecting the answers to the above questions, you can more clearly articulate your purpose. As soon as you've determined what this statement is, start applying it to how you live your day-to-day. Canfield stresses, by using this statement as a guiding principle, you can more easily find your life purpose. To hear all of Canfield's tips for determining your purpose and living a life aligned to it, click on the video above. Having an effective and engaged sales team is one of the keys to guaranteeing your business’s success. Some people are natural sales men or women—they have the gift of gab, the ability to easily connect with others and win their trust, and are adept at juggling leads and following up with prospects and existing customers alike. For most of us, though, sales skills need to be developed. Things like cold calling, making an effective pitch, and understanding prospecting strategy are not always intuitive, and so it’s critical that you offer your team training in various areas so that they can become the confident, well-rounded, skilled salespeople that will perform best for your business. The first step here, of course, is to understand your sales team’s strengths and weaknesses. Now, these may be different for each person on your team. Maybe you have one person who doesn’t have any trouble picking up the phone and chatting with strangers multiple times a day, but who lets follow-up requests sit in his inbox. Meanwhile, you have another team member who’s skilled at managing relationships with existing customers and making up-sells, but who struggles with her demo presentations to prospects. A good jumping off point is finding a sales training program that can cater each team member’s individual needs. Hubspot has a great list of sales training courses that cover a wide range of topics and are accessible at a variety of price points. Providing your team with access to a generic course that can help them brush up on the skill or skills that need the most work is a great way to start getting everyone on equal footing. While having a general understanding of sales techniques is important, you’ll also want to create a course specifically for your business’s sales team. Each business has its own approach, and you’ll want to share tips and tricks, plus help them avoid pitfalls, that are unique to your business. The first step here is to ensure that your team understands your value proposition. This is the driving force behind why you started your business, and it’s the reason that your salespeople are selling the good or service you offer. Trumpeting your value proposition empowers your team to motivate every action they take with that “big picture” idea always in mind. From there, you want to make sure your salespeople understand your process and approach to sales. Is there a specific CRM tool you use and a way that you want information recorded? Do you have a script for cold calling or emailing? Do you have a set list of answers to questions frequently raised by prospects? Is there a system in place for alerting managers to potential issues that crop up with unhappy leads or customers? And how does your set approach incorporate the marketing team in the sales process? When you have a clear and established set of systems and processes in place for your team, you provide them with a context in which to work, which then frees them up to focus on the art of selling and closing the deal. One of the most daunting things about interacting with prospects or customers is that a salesperson can never predict how exactly the conversation will go. Experienced salespeople have seen and heard it all, but if your sales team is newer to the game (or just unfamiliar with sales at your particular company) they may feel intimidated by the unknown. Much like a new airplane pilot starts out in a flight simulator before getting behind the wheel of an actual plane, you can start the greener members of your sales team out with role playing. Put together a list of the types of tricky prospects your salespeople might encounter: The one with lots of questions, the one who doesn’t want to pay full price, the one who declares they hate the product. Create a rough outline of a script for each scenario that details the points you want the “prospective customer” to hit. Then, get the whole team together and pair up members of the team, having more senior salespeople playing the customer and the newer team members acting as the salesperson. When the role play wraps up, ask colleagues to weigh in on what the salesperson handled well and what they could have done better. Then have the pair reverse roles and replay the scenario, so that everyone can see firsthand how the salesperson incorporates the suggestions from their colleagues and artfully dodges those common pitfalls. There is a lot of value in a great business book. Sometimes courses get monotonous, but a well-written book with compelling arguments and case studies can help a concept jump right off the page, and it can inspire the reader to try a new approach or tackle a new challenge. Consider putting together a reading list for your team that includes titles by some sales experts you really admire. If someone on your team is excited about a particular book, hop on Amazon and order it for them. Make it as easy as possible for them to encounter fresh, new ideas that can revitalize their sales approach. You might even take things a step further and set up an actual in-office book club. Select a title for everyone to read, and then gather the group together a month later to discuss. Come with your own questions and topics to help guide the discussion, and allow your employees to share their impressions, what they learned, and how they think they can implement some of the tactics or approaches covered in the book in their day-to-day work life. One of the best ways to learn sales techniques is to watch someone else do it skillfully. If you have a team with some more seasoned salespeople and some other who are less experienced, creating a mentorship program can be a great approach. Pair each novice up with a mentor. Allow them to listen in on their mentor’s sales calls and to tag along for in-person meetings and pitches. Learning from a pro in the field is one of the fastest ways to help develop a rookie’s technique. Also ask your mentor to provide feedback to their mentee; have them establish a monthly sit-down over coffee that encourages an open dialogue between the veteran and the beginner. Studies have shown that mentorship programs have benefits for both the mentors and the mentees. Your novice gets to learn new skills, and your veteran gets to develop leadership skills that prepare them for even greater career growth. You have plenty of options when it comes to sales training. From the preexisting courses on particular topics to more customized, in-house training programs, you should be able to strike the right balance and create an environment that empowers your team to succeed.